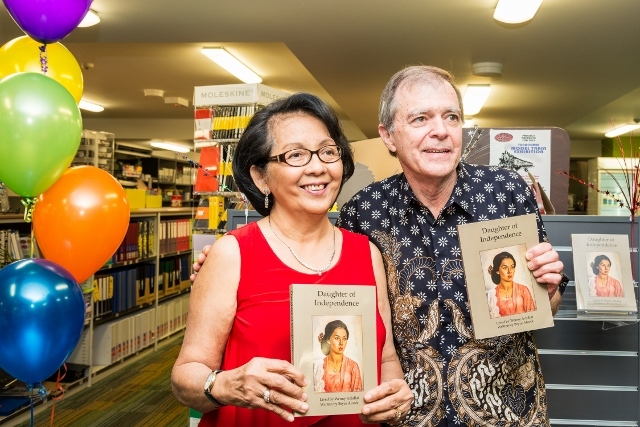 An enthusiastic audience of 90 people celebrated the release of Daughter of Independence at the University of Southern Queensland on Thursday evening. Launching the book, Senior Lecturer Richard Gehrmann said that it provides “a real insight to the human dimensions and changes occurring throughout the history of Australia’s nearest neighbour.” He also described it as a book about a changing Australia, illustrating the changes in attitudes to race and migrant families. 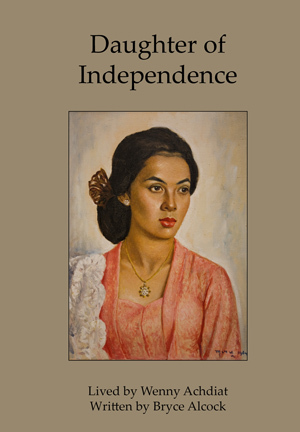 And thirdly, he said, “it is a book about Wenny herself, and from this point of view, the personal one, the book is most moving.” He described it as a story of the success of a woman who faces many challenges. Wenny spoke of her gratitude for the many people who helped her face those challenges, and Bryce thanked all those who had contributed to the book by providing information, guidance and encouragement. He read a short passage from the book about Dutch soldiers coming to arrest Wenny’s father when she was eight. 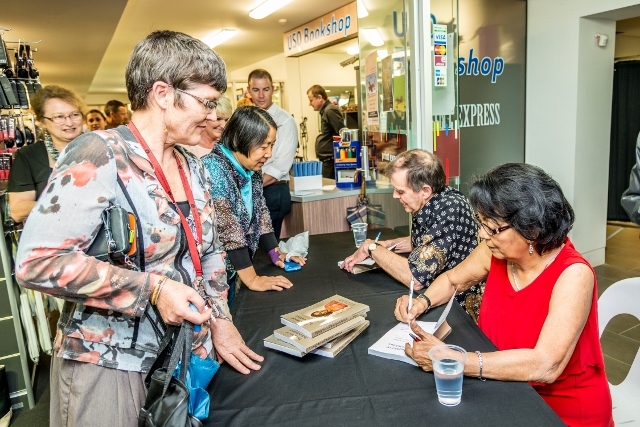 The USQ Bookshop was the ideal venue for the launch, with the large space within the shop combining with the mall outside. The USQ Multicultural Centre provided equipment and refreshments – and balloons! Many books were purchased, so that Wenny and Bryce were kept busy signing them well past the scheduled closing time. About 50 of the launch guests continued celebrating over Indonesian food at the post-launch party at Ann and Bryce’s home. Everyone agreed – it was a wonderful celebration!